The Toy Monster is a large mini-boss constructed out of a variety of toy-like creatures. It appears in Donkey Kong 64, where it is encountered in a room that only Chunky Kong can access in the R&D Room in Frantic Factory. After Chunky Kong defeats a variety of toy-like monsters, at least half-a-dozen more bursts out of a nearby toy chest. Instead of attacking Chunky, these toys will instead fuse together to form the Toy Monster. 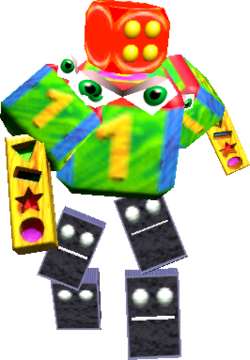 It has several Sir Dominoes for legs, a Mr. Dice for a head, Rulers for arms and Super Blocks for a body. Chunky must jump into a nearby Chunky Barrel to become the gargantuan Hunky Chunky, who is equal in size and strength to the Toy Monster. It walks after Hunky Chunky slowly, attempting to bludgeon him with its rectangular arms. The easiest way to defeat the Toy Monster is to run in and attack, then run away before it can retaliate. After enough hits, the Toy Monster will fall apart, and then a Golden Banana will appear to Chunky. On a side note, although the shock wave attack does damage this enemy, Chunky Kong will end up hurting himself during the process. This page was last edited on March 28, 2019, at 19:23.